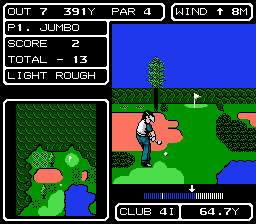 NES Lee Trevino's Fighting Golf (USA) in 08:25.17 by Acmlm. Lee Trevino's Fighting Golf is a one to four-player NES/arcade game released by SNK in 1988. Gameplay is relatively simplistic, but was on par with video games of the period. The player has to avoid sand traps, water hazards, rough ground and trees. The courses range from relatively straightforward fairways to elaborate arrangements of sand traps. Despite the title, no fighting is involved in the game. The player can choose between four different golfers, of which each character has his or her own advantages and disadvantages. Lee Trevino is playable as a character named Super Mex (an actual nickname of his); other characters include Pretty Amy, Miracle Chosuke and Big Jumbo. Despite having the worst control, Big Jumbo is used here for his specialty with ranged hits. In this run, Acmlm uses precise hits and luck manipulation to beat all 18 holes as fast as possible, which results in a very low final score as well.